These sessions offer the opportunity to combine creativity, spirituality and contemplation. Participants experiment with different watercolor techniques and produce one or more paintings. In the process, participants pause to notice and observe what is happening on the page and within themselves. They are invited to create and to rejoice about what is given. This workshop offers space to integrate the experience into daily life. 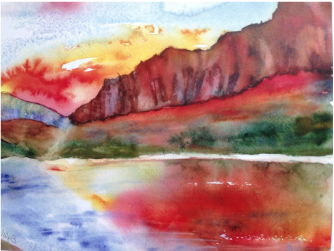 Watercolor workshops are facilitated by Sylvie Gudin Koehn. Contact Sylvie at SylvieGK(at)mwc-cmm(dot)org or 574-522-2890 for more information or to register.